The film begins, and you're baffled more and more: It's a silent film! 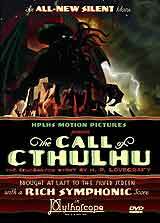 And indeed a faithful adaptation of Lovecraft's frightening tale which told the story of a man who in his late great-uncle's papers finds hints about the existence of an ancient monster called the mighty Cthulhu which is of such unspeakable horror that the knowledge of it is driving people insane. But "Cthulhu" was, as you recall, written in 1926 and first published in the American horror pulp magazine Weird Tales in February 1928. That was at the end of the silent film period, Lovecraft wasn't even famous then, and later the story has been repeatedly considered "unfilmable". Your mind snaps. How can there be a silent film based on the story? But there it is, right before your eyes! Cut fast, with imaginative imagery, and an expressionist mood. Have you by chance discovered a forgotten treasure of silent film history? You have. The film you saw is indeed a silent film adaptation of H.P. Lovecraft's story, but not from the silent film period but from the year 2005, an independent low-budget production pulled together by the H.P. Lovecraft Historical Society, "a couple of guys with backgrounds in theatre and film." This dedicated team combined the skill of a professional and the love of a fan to create a unique movie that captures the mood of the silent film age and brings Lovecraft's outstanding tale faithfully to the silver screen. They even succeed in creating the horrible Cthulhu himself about which Lovecraft wrote: "The Thing cannot be described -- there is no language for such abysms of shrieking and immemorial lunacy, such eldritch contradictions of all matter, force, and cosmic order." The re-creation of an older style, jokingly called Mythoscope by the HPLHS film-makers, is the appropriate technique to bring a story such as Lovecraft's to the screen. I'd love to see something like, oh, Frankenstein done this way. And at least a few retro silent films have already been produced on a bigger budget in recent years, for instance Franka Potente's directorial debut or this year's Argentine smash hit LA ANTENA. Or how about another Lovecraft adaptation? The producers of CALL OF CTHULHU are already working on the next one, THE WHISPERER IN DARKNESS, based on Lovecraft's short story first published in Weird Tales, August 1931. A trailer can be seen on their website. And oh -- you don't have to drive to some forgotten town with only one movie theatre to find a late-night performance of THE CALL OF CTHULHU. It's now out on DVD, including not only the 47 minute movie with intertitles in -- total madness -- 24 languages, but also a highly entertaining half-an-hour "making of" documentary, featuring behind-the-scenes material and interviews with cast and crew. Also, a trailer, photos from the set, production stills, deleted footage and a printable souvenir replica of the Sydney "Bulletin" as used in the movie. A must-have item for silent film and horror fans. Highly recommended.